On a humid day where continuing unseasonable warmth saw yet more riders overheat and abandon, Cannondale-Cyclocrossworld.com teammates Katie Keough and Stephen Hyde both initiated and won dramatic last-lap duels to claim first places on the UCI C2-rated second day of Charm City Cross in Baltimore, Md. In the women’s race, Becca Fahringer (Stan’s NoTubes-Maxxis) took the early lead to create an initial selection, though she was left chasing when the Cannondale duo of Keough and Emma White eventually peeled off a further selection with Maghalie Rochelle (Clif). Even when a gap appeared to her teammate White, Keough continued to drive at the front, trying to break the Canadian national champion. On the final lap, Rochette finally took the lead, but could not snap the elastic, and following an uphill remount after a set of stairs, Keough created a tiny gap and held it to the line. The win completes her sweep of the Baltimore weekend, and consolidates her lead atop the US Cup-CX standings. Caroline Mani (Van Dessel) caught and passed Fahringer for fourth place. In the men’s race, Hyde assumed control early, driving the pace for well over a lap until he forced a group of seven clear. By mid-race, the winning group of five had consolidated: Hyde, Kerry Werner (Kona), Tobin Ortenblad (Santa Cruz/Donkey Label), Spencer Petrov (Aspire Racing) and Jamey Driscoll (Donnelly). The 19-year-old Petrov became a main protagonist, attacking repeatedly to stretch out the group, but his efforts would not stick, and the group of four — Driscoll suffered a broken chain — went into the penultimate lap together. U.S. national champion Hyde took over at the front, and he took a hard dig on the uphill remount after the stairs, prying Petrov away from chasers Werner and Ortenblad. Hyde continued to pad the gap until he lost traction and went down on a series of off-camber U-turns; fortunately for him, Petrov could not avoid crashing over the top, and Petrov took longer to get up and going. Hyde powered to the finish, with Petrov riding in with a bent brake/shift lever, and Werner claiming the final podium spot. Ortenblad’s fourth place was good enough to retain leadership of the US Cup-CX series. 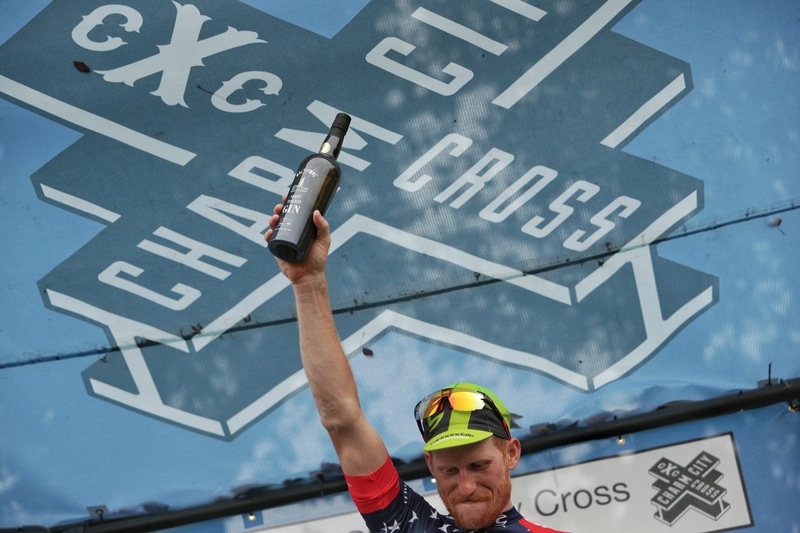 Stephen Hyde celebrates atop the podium of Charm City Cross day 2. Highlights from the UCI C1-rated day 1 are here. Full results are posted at livelynxresults.com. Lead photo: Kaitie Keough leads Maghalie Rochette. All photos © 2017 Bruce Buckley.